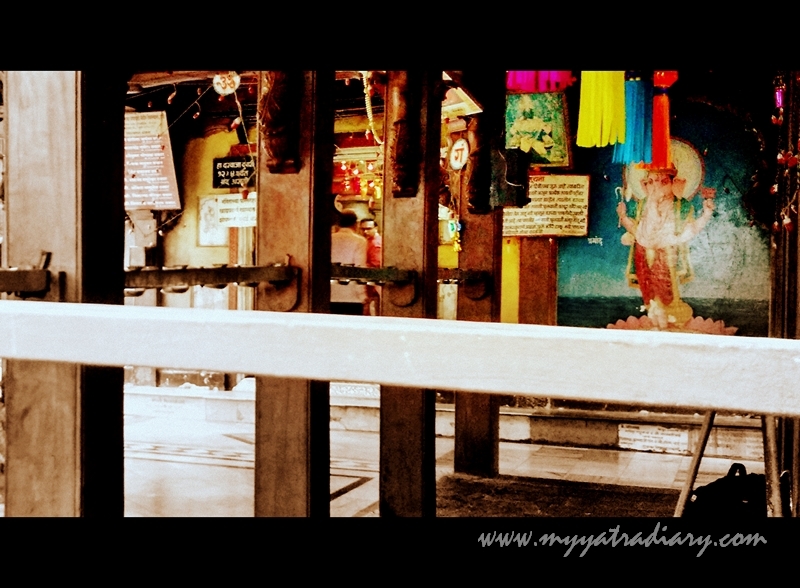 Rooted in Simplicity: Shree Kasba Ganpati Temple, Pune's Gram Daivait. 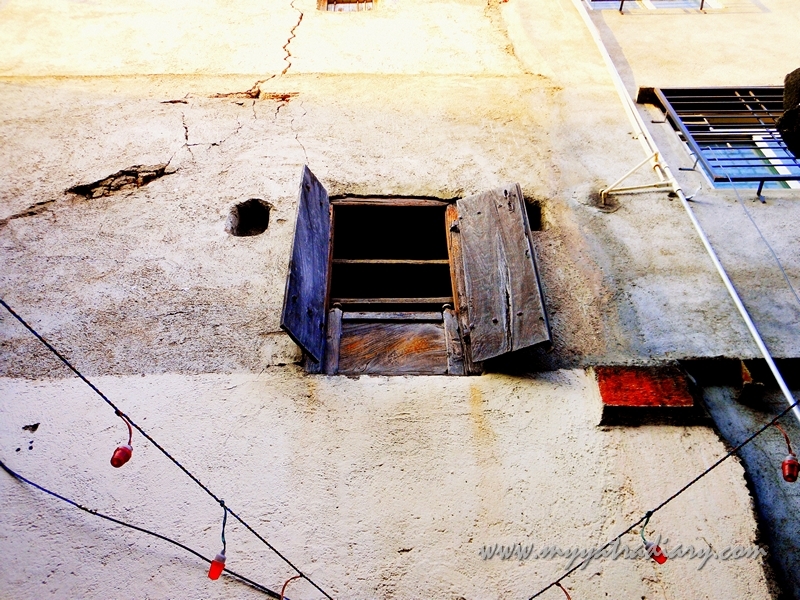 Old parts in a city resonate with their own unique charm of an era gone by. Etched on them are marvels – not always and often less than what some of us might generally consider perfect and faultless but almost always warm, devoid-of-any-pretence and shining in its own beauty of unconscious simplicity – that give us a sneak peek into the way of life and living of our forefathers and ancestors who have walked the earth. One finds such a charm in Pune disguised as peths and wadas – there are about 17 of them (Sadashiv Peth, Narayan Peth, Rasta Peth, Nana Pet, Navi Peth, Ganj Peth (now renamed Mahatma Phule Peth), Budhvar peth, Somwar peth, etc.) all built and developed during the Maratha rule under the Peshwa administration. These peths are some of the oldest inhabited places of the city which still regale visitors with its narrow lanes and dilapidated structures painting a vintage picture of antiquity and a firm rootedness to traditions and culture. 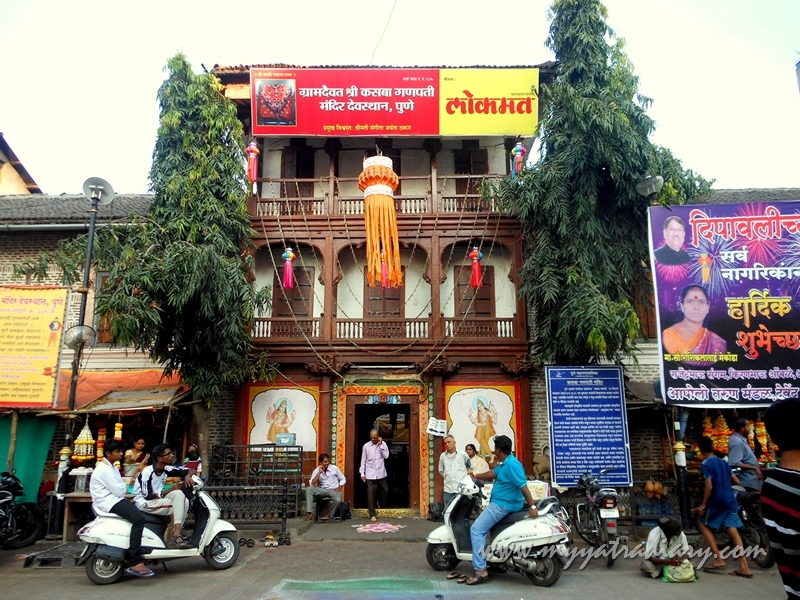 Pune's Gram Davait - Shree Kasba Ganpati Mandir Devsthan in Pune. I have been to a few peths in the past but my visit to Kasba Peth this time was the first. Kasba Peth is the oldest residential peth in Pune established during the fifth century. Located beside the Shaniwar Wada palace-fort, Kasba Peth is also referred as the 'Heart of Pune City'. 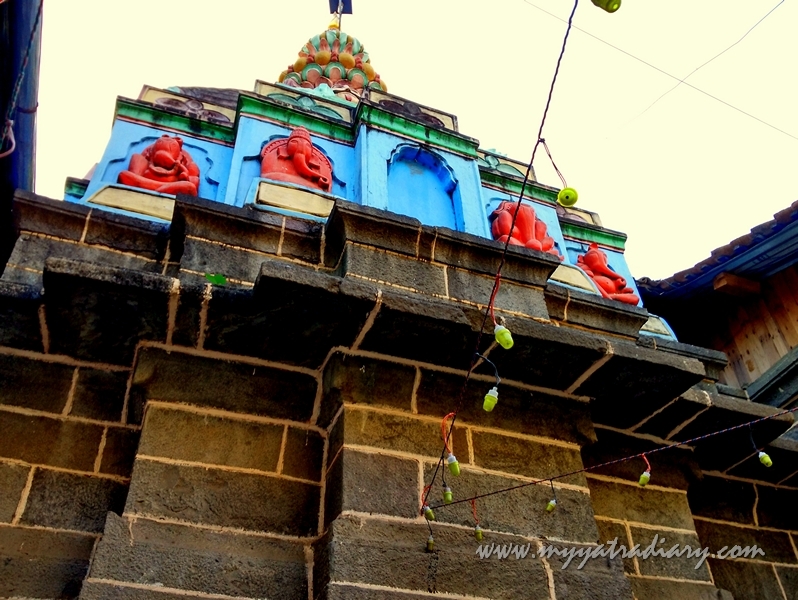 Not only because of its location but metaphorically speaking too – Kasba Peth houses Kasba Ganpati, Pune's Gram Davait or the presiding deity Ganesha who looks after the well being of the people of Pune. Kasba Ganpati Temple from the outside. One look at the Kasba Ganpati temple and I stood mesmerised by its natural appeal - its stark minimalism devoid of any lavish adornment - outdoor as well as interiors - and I couldn’t help but be reminded of the simple straightforward nature of the people of those times, including the valiant, strong and heroic Jijamata who is credited with establishing the temple. 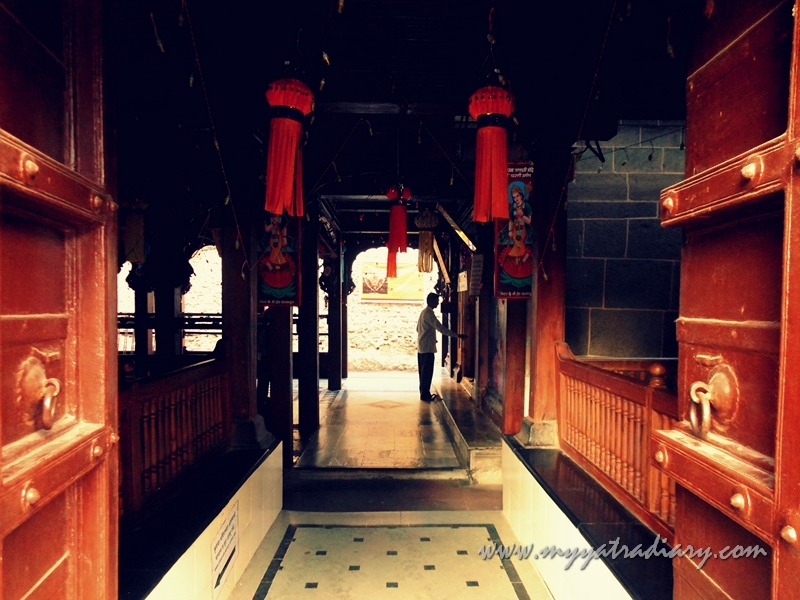 Built in the typical Puneri Wada style, entering the temple felt very human as if it were the house of a friend - so earthy and in tune with nature was its appeal! Remove your footwear and step in! 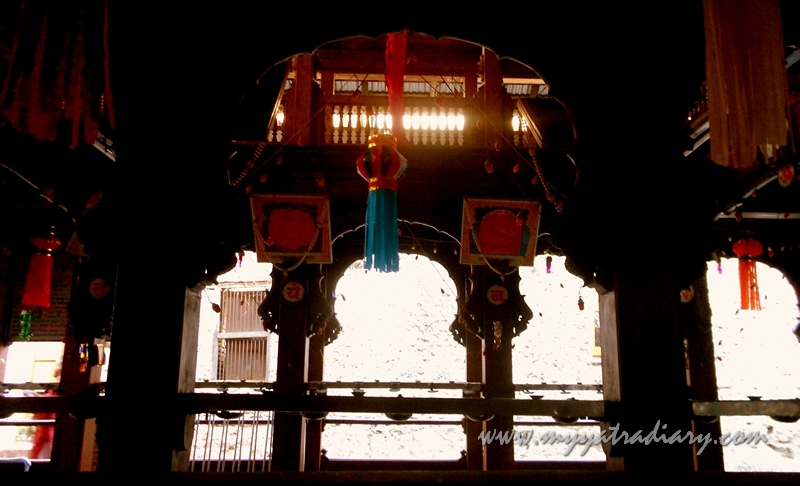 The temple hall was small in size and pictures of all Ashtavinayaka Ganesha's adorned the sides of the wall. Colourful lanterns hung from the ceiling while festive lights dangle criss-crossly through the arches. The vibe was calm, intimate and peaceful making it easier to have a conversation with Him, to seek clarity, to reflect in the solitude minus the outside chaos or the lure of things and possessions (wi-fi!) or to simply find assurance in His comforting gaze. Photo's of syambhu Ashta vinayak's in Pune. The story of the establishment dates back to as far as the 16th century when the Maratha queen Jijabai Bhosale had just arrived in Pune with her 12 year old son Shivaji. A young, energetic Shivaji was determined to fight against the Mughal empire and set the Maratha kingdom on a path of freedom and glory. 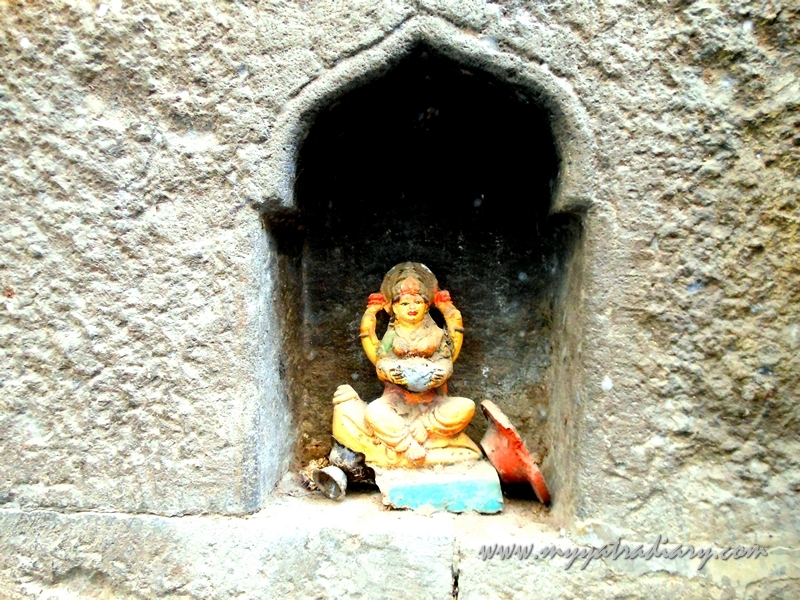 During those times, an idol of Lord Ganesha was found by some boys residing nearby. Queen Jijabai started worshipping this Ganesha which prompted Dadaji Konddeo (a nobleman who oversaw the training of young Shivaji) to build a temple, which is today known as the famous Shri Kasba Ganpati Mandir in Kasba Peth. Since then, Pune has seen an unprecedented growth in its character. No wonder then, it is also called the city of Lord Ganesh and the festival of Ganesh Chaturthi is celebrated with great aplomb and fervour, a tradition initiated by Lokmanya Gangadhar Tilak in 1893 with an aim of bringing people together during the freedom struggle. When a conflict arose between the different Ganesha mandals as to which mandal shall lead the Ganesh Visarjan (Immersion) process, Lokmanya Tilak solved it by according the premier status among all Ganeshas to Kasba Ganpati in the ten day long Ganeshotsav or Ganesh Chaturthi festival. How dear is Kasba Ganpati to Punekars or the people of Pune can be gauged from the fact that Kasba Ganpati is 'Manacha Pahila Ganpati' (Honoured as the leader) among all other Ganesha's in the city. And why only Punekars? One visit to Kasba Ganpati left me spellbound by its sheer perfection - beautiful in its flawless simplicity and mystery; steeped in history and tradition - reminding me that in a world obsessed with fleeting trends and pursuit of perfection... true style and classic elegance still lay in rooting ourselves to simplicity... in getting back to our basic nature of sincerity so that from it could grow the tree of value and significance. What are the timings of Kasba Ganpati? How to reach Kasba Ganpati? Google address is 158, Kasba Peth, Pune, Maharashtra 411011. But ask anyone, really! Best time to visit? Kasba Ganpati is during the 10 day Ganesh Chaturthi Festival. Celebrations are purely traditional and one of it's kind. Great temple, Thanks for your post and Beautiful pics. Dear Arti – Things are relative. 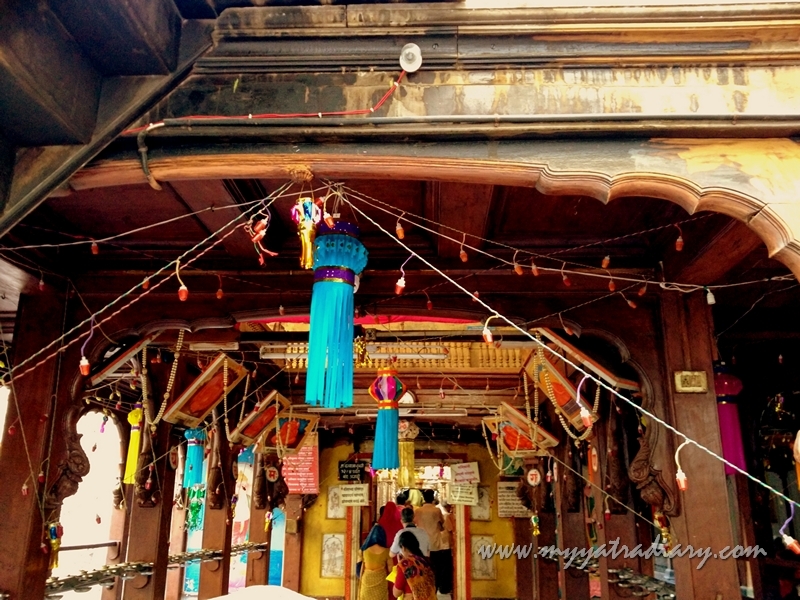 To me who is familiar with the sheer simplicity of the temples of my country, this place looks a little more colorful and decorated, but indeed look different from the Hindu culture what I’ve often seen in this blog. I like the quaint atmosphere and your wording; “almost always warm, devoid-of-any-pretence and shining in its own beauty of unconscious simplicity”. What makes us feel comfortable and welcomed is not perfection but the beauty that is imperfect and incomplete, which I think is shown in your photos. I am avid traveler from Pune and have covered many places around but today, I feel I am yet to cover lot of places around Pune. This is the first time I am hearing about this Gram Devta temple and will soon visit. Thank you Arti for sharing this.